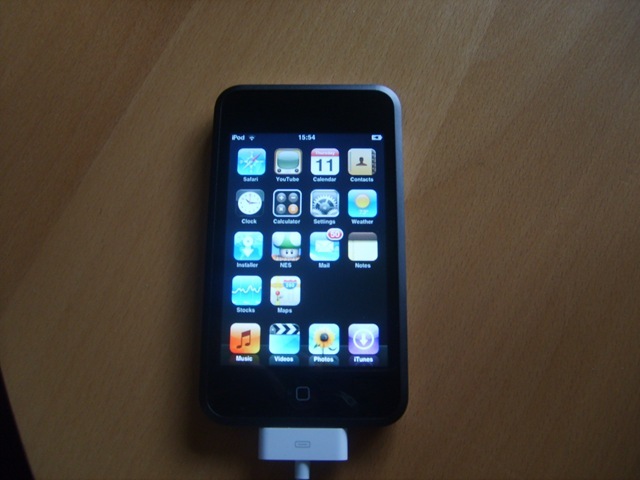 Those clever hackers have finally jailbreaked the iPod Touch. After a little wrangling I’ve managed to unlock mine and have gone install crazy. EDIT: I followed these instructions for unlocking the touch with Windows. I’ve been signed up to the Cloud.net iPod WiFi service for a week or so now and it seems as though the kinks have been ironed out. My previous complaints regarding dysfunctional hot-spots and the need to re-enter my account credentials for each and every hot-spot have been solved. The Cloud’s coverage is pretty good too. I can pretty much guarantee I’m never more than a few hundred yards in range of a hot-spot on my travels. It’s a liberating experience to be so connected. Sure, I still cart my laptop around with me wherever I go and could theoretically be part of the cloud using that, but there’s something to be said for the instant accessibility of a handheld and Internet enabled device such as the iPod or iPhone. I signed up for the Cloud.net special iPod WiFi deal yesterday. For £3.99 a month I can logon to any Cloud (or Cloud partner) hotspot and browse away unlimited with my iTouch. Well, at least in theory… I’ve found so far that 3 of the 6 hotspots I’ve tried just straight-up didn’t work at all. Also I was under the (false) impression that as I supplied my MAC address I wouldn’t have to logon to each and every hotspot before I can surf, not a huge issue but a pain anyway. Well aint I the fool. Seems as though my iPod Touch wifi issues were caused by my thumb being over the wifi aerial. D’oh. I’m a lefty and tend to hold things that way – in my defense. Since figuring out my thumb is an effective signal blocker and thus remedying the signal problems by moving said thumb, everything has been a-ok. So far the signal has been rock solid and seems much quicker than previous. Some of this may be due to the recent software update delivered via iTunes though. Still don’t know exactly what this has fixed other than the obvious screen issue. Edit: WOW. Looks like they’ve fixed the issue with screen brightness. At least to my untrained eye. Wifi still flakey as ever. Not sure about anything thats changed. Ugh thanks to coverflow on the iPod Touch. I’ve been spending way too much time going through iTunes and adding album art for all my tracks. Incidentally, the iTunes music store album art gatherer thingy ™ is absolutely useless. A couple of things bothering me with the new iPod so far: the music scrubber and wifi. The music scrubber (you know, the thing you drag left or right to change position in a track) is so small you can’t accurately move it. Quite a drag (pardon the pun) for me as I like to listen to long DJ sets and skip through bits. With the scrubber the way it is now it’s almost impossible for me even with my tiny girly fingers. The second issue is the wifi. OK I didn’t buy it specifically for this but the wifi isn’t exactly robust. I’ve been messing around with Safari over the wifi connection and its probably flaking out at least every 2-3 minutes. This is while my laptop is maintaining a rock-solid 100% connection to the same router so I know its not an issue there. Anyway, these are all things which can be fixed via software updates so i’m not too bothered. Its still a fantastic device. Well I’ve had a couple of hours with the Touch so far and it seems as though I’ve got one of the notorious < week 38 manufactured units that doesn’t quite display blacks as intended. Despite the screen issue (which shouldn’t be too much of a problem, I’ll get a replacement as most people with week 37 units seem to be) I must say i’m hugely impressed with the device. Navigation through the music library couldn’t be easier and coverflow works great when using horizontal orientation. I’ve had a couple of crashes here and there when browsing the web using Safari, one on facebook and one on gmail. Youtube is pretty cool on the touch. The only disappointment is iTunes on the device. It doesn’t let you download podcasts which would be a pretty handy feature IMO. I’m sure this will be solved with a software update in due course however. So I was taking a little browse round John Lewis in Reading today and noticed they had the iPod Touch on display and for sale… Yay. Obviously I bought one, just filling it up with tunes and videos right now so can’t really comment much on it yet. I’ve been fiddling about with Safari on it and the browser experience seems really nice. That’s all for now. I’ll comment some more when I’ve really used it!